If imitation is the sincerest form of culinary flattery, Burger King Worldwide (BKW) is praising McDonald's (MCD) playbook. Burger King rolled out new menu items last week. One of the additions is popcorn chicken. The bite-sized pieces of breaded and fried white-meat chicken breast should be familiar to folks that saw Mickey D's roll out its Chicken McBites earlier this year. McDonald's added a spicy version of its McBites earlier this summer. It's probably just a matter of time before "The Home of the Whopper" follows suit. When Red's Giant Hamburg on Route 66 introduced a drive-thru window in 1947 it made too much sense to ignore. It was quick. It was convenient. It was a hit. Chick-fil-A founder Truett Cathy is credited with inventing the boneless chicken breast sandwich in 1946 as a burger alternative. These days it's hard to find a burger joint that doesn't offer a chicken sandwich on the menu. Once Quizno's began achieving success with its baked sandwiches, Subway installed quick-baking TurboChef ovens. If something works, others will follow. However, it does seem as if Burger King is just ripping page after page out of McDonald's playbook. Burger King isn't afraid to copy what works. Burger King's springtime menu shakeup left many critics complaining that the chain was trying to be McDonald's. The addition of fruit smoothies, oatmeal bowls, caramel frappes, and chicken wrapped in soft flour tortillas was just too obvious. However, Burger King does earn a few points for originality this go-round: It's introducing plenty of unique items this time around. It's bringing back a variation on its chicken parmesan sandwich and adding Italian twists to the snack wraps and breakfast burritos. Other seasonal or recent additions at Burger King include ribs, pulled pork sandwiches, and sweet potato fries, a menu addition that hadn't made its way to the golden arches first. Cynics will argue that McDonald's was simply copying Yum! Brands' (YUM) KFC which has been serving popcorn chicken for years. They're right. However, it can't be a mere coincidence that Burger King is hopping on the trend mere months after McDonald's updates its menu. After a brief hiatus, Burger King became a public company again in June. That means the pressure is back on it perform on a quarterly basis, so expect the burger wars with McDonald's and Wendy's (WEN) to continue to intensify. Now that the burger chains also have to look over their shoulders at the fast-growing gourmet burger chains, they can't afford to think too far outside of the burger box. If something works for one major burger restaurant, it's going to be copied by its peers. Burger King (BKW) might still be home of the Whopper, but it's far from ruling the burger industry these days. The fast-food restaurant ranks third among the hamburger giants: Last year, Wendy's (WEN) unseated the chain for the No. 2 spot, and it has never been in range of McDonald's (MCD), the undisputed leader, according to consulting firm Technomic. Burger King's new status as a public company could give the place to "Have it your way" a fresh start, and energize its recent efforts to woo back shoppers, Steven West, an analyst with ITG Investment Research, tells DailyFinance. The company returned to the New York Stock Exchange last week, its home from 2006 until 2010, when it was acquired by private investment firm 3G Capital. 3G's revival strategy for Burger King included its biggest menu expansion ever last year -- adding items from premium salads and frappe drinks to bacon sundaes -- and a star-studded national ad campaign that ditched its (arguably creepy) "King" mascot for celebrities like soccer star David Beckham and Jay Leno. 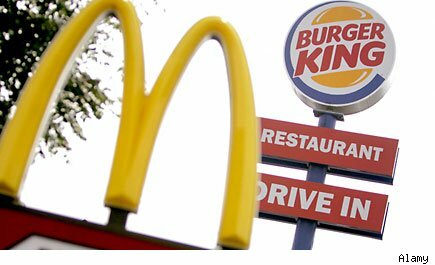 Fast-food lovers seemed to respond: For its most recent quarter, Burger King posted its best comp-store sales performance in more than two years. But there's still work to be done at the No. 3 burger chain if it's going to take a bigger bite out of the fast-food market, West says. In the battle for burger supremacy, McDonald's has been eating the competition's lunch for the past eight years, West says. "They're on their second remodeling effort in the U.S., and they have definitely raised the bar when it comes to consumer expectations," he says. Meanwhile, Burger King "has been trying for a decade to replicate the McDonald's playbook and has failed to do so." But the IPO could mean a reversal of fortunes for Burger King. "Their new restructuring plan, the use of joint ventures and the procurement of financing through the IPO could spell good times ahead for the 'king of the Whopper,'" West says. First, Burger King will use its newly public status to get its financial house in order, West says. "In this case, the proceeds will be used to pay down debt, thus lowering interest expense, and helping with net earnings." Then comes reinvesting in the business and stepping up expansion -- especially overseas. "Over the next few months, Burger King will see accelerated re-franchising of company-owned stores ... then accelerate unit growth both domestically and internationally, though about 80% to 90% of unit growth will likely be international," he predicts. Burger King will "continue to bolster their menu offerings in the U.S." -- but new items must be "innovative" if the chain wants to win over more fast-foodies, West says. That push should go hand-in-hand with beefing up customer service, he says. Indeed, new and more complex menu items, like smoothies, frappes and wraps, have slowed down its service because they reflect "new ingredients, new processes, etc., and thus take [workers'] time to become efficient at making them fast-enough for a drive through operation." McDonald's has fancied up its units with store remodels that include new half-moon-shaped booths, wooden blinds and even flat-screen TVs, which have changed the popular idea of how a fast-food chain should look these days. Hence, Burger King needs to spruce up its digs, too. "They need to remodel the store base," West says. "As McDonald's CEO says, 'You can't sell a $6 burger out of a $3 store.' "
Longtime Motley Fool contributor Rick Munarriz does not own shares in any of the stocks in this article. The Motley Fool owns shares of McDonald's. Motley Fool newsletter services have recommended buying shares of McDonald's.